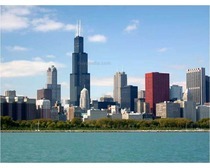 The once tallest building in the world, Sears Tower, stands erect at 1,450 feet on the Chicago skyline. Browse through this article to know some interesting and fun facts about Willis Tower. Sears Tower or Willis Tower falls in the category of the top 10 tallest buildings from around the world. Although this building was preceded by the One World Trade Center, it was succeeded, in both height and the floor count, by the Petronas Twin Towers in Malaysia. The tallest building in the western hemisphere and the tallest building in the United States, the Sears Tower, a business center and is also a huge tourist attraction. Located in the heart of today’s biggest skyscrapers in Chicago, Illinois, this attractive and elegant building was constructed in 1974 and was labeled the coveted title of the tallest building in the world at that time. The Sears Tower, now known as Willis Tower, is a perfect example of revolutionary bundled-tube structural design. The tower’s skydeck observatory, located at 1,353 feet from the ground, in the air, extending 4.3 feet outside, is the most spectacular highlight of this tower, giving the visitors an unforgettable experience. Find out more interesting and fun facts about the Willis Tower, aka Sears Tower. Highlights: The tallest building in the United States and the 7th largest structure in the world. Willis Tower was the world’s tallest building for about 23 years, until it was surpassed by the Petronas Twin Towers in Kuala Lampur, Malaysia in 1997. This skyscraper even eclipsed New York’s twin-towered World Trade Center by 25 meters (83 feet). Currently, the Willis Tower is the seventh-tallest freestanding structure in the world and the fifth tallest building in the world to the roof. In 2006, seven men were arrested by the FBI and were charged with conspiring to destroy the tower? Standing tall at 1,451 feet above ground, the tower consists of 108 stories with 16 double-decker elevators. 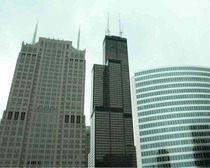 Sears Tower has the second highest number of rooms in a building, after the Pentagon. The Skydeck allows tourists to look through the floors to the street due to the all-glass boxes and glass balconies. Elevators in the Sears Towers take the tourists to top floor in 60 seconds. One of the major tourist attractions in Chicago is the Sears Tower observation deck, known as the Skydeck. It is situated on the 103rd floor (1,353 feet above ground) allowing the tourists to view the plains of the nearby places, like Illinois, Lake Michigan, Indiana, Michigan and Wisconsin. The building has nine framed tubes or nine skyscrapers that combine to make one building, in a 3x3 matrix. It is interesting to know that the Sears Tower looks different from all angles. The structure of the building was designed by architect Bruce Graham and structural engineer Fazlur Khan. The two television antennas added to the building in 1982 increased the height of this fascinating skyscraper to 1,707 feet. Additionally, the western antenna was further extended to 1,730 feet. The Sears Tower was the property of the largest retailer in the world, Sears, Roebuck & Co. until it was sold to Boston-based AEW Capital Management in 1994. Although the company vacated the tower in 1995, it continued to hold the name till 2003. Eventually in 2009, London-based insurance broker, Willis Group Holdings Ltd. leased a portion of the tower and hence, acquired the naming rights. The tower was officially named as Willis Tower in July 2009. Sears Towers is featured in the popular PC games, Conquer: Red Alert 2 and the Rampage Series and Command. If you urgently want to you the restroom, you will have to travel all the way to the 103rd floor on Sears Towers. Yes, the bathrooms on the 103rd floor (Sky Deck) are the highest in the world and are located 1,353 ft. ground level. The observatory elevators housed in the tower are the fastest in the world at 1600 feet per minute.